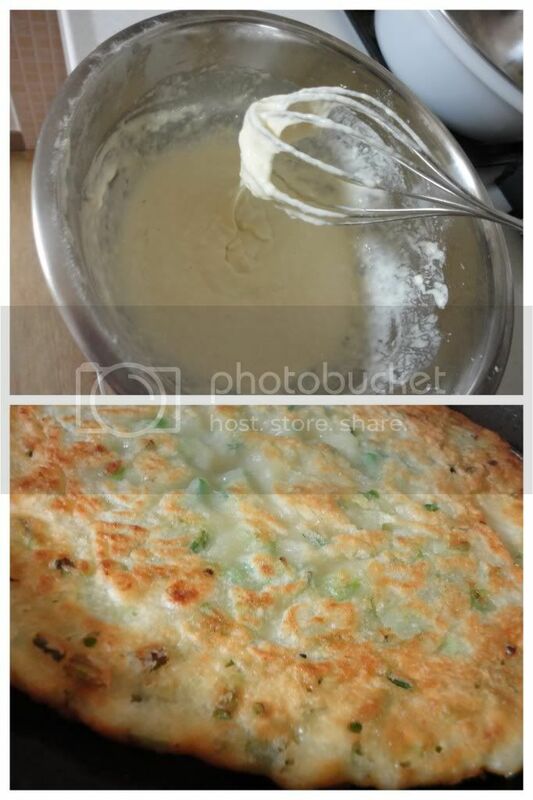 Flour + Water...this type of pancake requires a thick batter. I just dump in some flour, perhaps a cup (makes 1 pancake large enough for two to share) and then half a cup to a cup of water. Again, the batter is thick, although I think mine has generally been too thick. Once you've come to terms with the thickness of the batter, let it set for half an hour or so taking in the view/air/potential yeast in the air. Throw in a fair handful or two of sliced green onions, add 1-2 Tbsp. olive oil, mix and pour into a well greased and hot skillet. Cook on both sides until crispy and no longer doughy in the center - perhaps 5 - 10 minutes on each side. Cut with a pair of kitchen shears and enjoy the pancake any time of day by dipping into a serving of garlic-infused soy sauce!